Sometimes an illness or fall precipitates the need for an individual, Maria Center resident, or a Catherine Kasper Home resident to utilize the services of Rehabilitation and Restorative Therapies. These services might be utilized on either an in-patient or out-patient basis at Catherine Kasper Home. The individual is assessed by a team of therapists to determine a personalized treatment program. 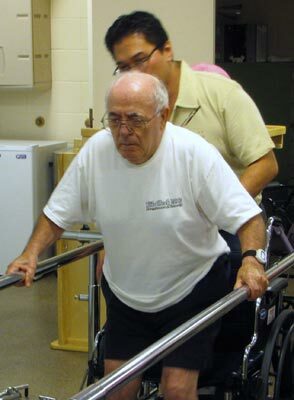 Restorative care assists residents in meeting individual goals and maintaining independence. When an individual requires in-patient care at Catherine Kasper Home, therapy progress determines the individual’s ability to either return to his/her home or independent living apartment or begin the process of permanent transfer to Catherine Kasper Home. Therapy Services utilizes qualified professionals to serve the occupational, physical and speech therapy. Each resident is assessed by a team of therapists to determine a personalized treatment program. Restorative care assists residents in meeting individual goals and maintaining independence and 90-95% percent of the patients in the skilled unit are eventually able to return to a home environment.